Leading Manufacturer of payroll software, e-tds software, hr payroll software, time attendance and payroll software, payroll system and payroll software system from Mumbai. 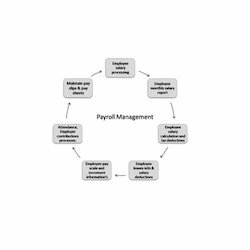 We are actively engaged in offering an extensive range of Payroll Software for our prestigious clients. It is one of the most powerful tools for Industries, Firms, Companies, Business Organizations etc. At our advanced manufacturing unit, progressive technology is used by skilled software engineers in developing process to increase usability of our offered software. Moreover, our quality controllers check this software thoroughly against various parameters at the time of delivery. Clients can avail this range from us at market-leading prices. Owing to the expertise of our professionals, we have emerged as the foremost organization of an excellent quality array of E-TDS Software. Used in diverse application areas of sectors, this software is widely acclaimed in the market. Our experts are assisted by sophisticated technology in developing this software. After procurement of the offered software, our qualified team of adroit professionals inspects the entire range to deliver the flawless supplies at clients end. Our clients can avail from us a wide assortment of HR Payroll Software at industry leading prices. Adhering to the international quality standards, our software is stringently checked by experts various parameters to the set industrial norms. In addition to this, our flawless software is widely demanded for its high performance and reliability among our clients. Our organization has successfully expanded its business in market owing to the offered elevated quality array of Time Attendance and Payroll Software. Well known for its remarkable features, this software is used to define accounts and transactions in numerous companies. Backed by the team of our professionals, this software is designed using high-grade components and advanced technology. Our offered software is designed with high precisions in order to meet the international standards. 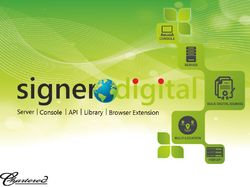 Apart from this, we provide this software as per the varied needs of our clients and at affordable prices. 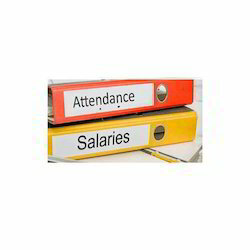 From the wide range of our products, we offer optimum quality Payroll System. These are designed as per the set industry norms using high grade components and latest technologies. In ahead of their final dispatch, this system is checked on various parameters. Our offered system is available for our clients at a very conventional range of prices. Keeping track with the market development, we are engaged in offering our clients with a wide collection of Payroll Software System. This software is highly demanded by the HR department of various organizations. This system is designed using ultra-modern technology. In order to deliver the fault free supplies at our client's end, this system is tested under the supervision of our vendors. signer.digital is an answer to your all bulk Digital Singing requirements, allowing you to sign multiple documents in an automated manner using legally valid Digital Signature. A product designed to attach digital signatures to documents/files. The digital signature appears in-line with the document making it possible to verify the signatures without using any third-party verification utility. The Acrobat Reader can be used to verify the signed PDF documents. The recipient of the digitally signed document can easily read the document while checking the Integrity, Authenticity and Non-Repudiation aspects. The tool supports bulk signing of documents through Standalone Desktop, Server & Console, or through API integration in your existing software/solution/ERP/CRM. This solution works with any Digital Signature Certificate, available in Own HSM, Multi-Tenant HSM Service by ‘Kluis’ as referred below, on remote location USB Token, USB Token on Server or PFX File. signer.digital libraries may be used for and Browser based signing from end user’s USB Token, DSC based Authentication is also supported. Prices given is an indicative price and can differ depending upon the features and requirements. With the assistance of our adroit professionals, we are engaged in providing XBRL Conversion Services. These services are rendered by our professionals keeping in mind precise requirements of clients. In order to render these services, our skilled professionals use advanced techniques and methodologies. Apart from this our valuable clients can avail these services from us in customized solutions and at market leading rates. Our offered services are appreciated for timely execution and hassle free management. We are identified as one of the most competent enterprises of this industry for offering a wide gamut of Income Tax E-Filing Software. Mainly used in income tax offices, this software are developed using latest technologies in synchronization with set universally accepted norms at vendor's end. In addition to this, our offered software is highly appreciated by our clients for its several qualitative features. 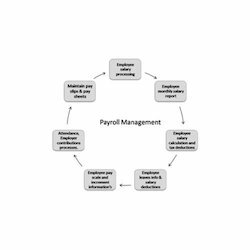 Being a clients focused organization, we are offering quality assured range of Payroll Management System. 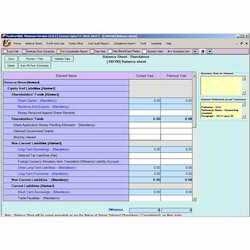 This system allows distribution of money in accordance to the work allotted. The main purpose is proper and authentic distribution of money that will prove to efficient for the firm. This management system will allow tremendous growth and proper distribution of wealth. They are well authorized and are available in a proper manner. In order to ensure that offered system is able to stand tall on the expectations of our clients, we sourced these scanners from our reliable vendors. This system is designed using superior grade basic material with the help of advanced technology in compliance with the set industry quality standards at vendor's end. 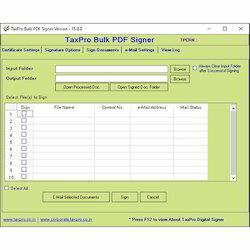 Bulk PDF Signer is a desktop product designed to attach digital signatures to PDF documents. The digital signature appears in-line with the PDF document making it possible to verify the signatures without using any third-party verification utility. The Acrobat Reader can be used to verify the signed PDF documents. The recipient of the digitally signed PDF document can easily read the document while checking the Integrity, Authenticity and Non-Repudiation aspects, using just the Acrobat Reader. The tool supports bulk signing of PDF documents available in a configured input directory and the signed PDF documents are placed in the configured output directory. Using Bulk PDF Signer, you can even place (display) the Digital Signature on the certain position. (Pre-defined or customized) This tool works with any Digital Signature Certificate, available in USBToken, pfx or p12 format.